SIOG, Amsterdam · 2018, C. Hoffmann et al. Compared to younger individuals, elderly patients with head and neck squamous cell carcinoma (HNSCC) have limited therapeutic options. Despite representing approximately 47% of the affected population with an increasing incidence, older patients are underrepresented from HNSCC prospective clinical trials further limiting their therapeutic options. Intensity-modulated radiation therapy (IMRT) represents a viable treatment. Yet, like with all radiation therapy (RT) techniques, the energy dose deposit to tumor cells is limited by the surrounding healthy tissues. Injectable hafnium oxide nanoparticles, NBTXR3, were developed to increase the deposited dose of ionizing radiation within tumor cells when activated by RT. 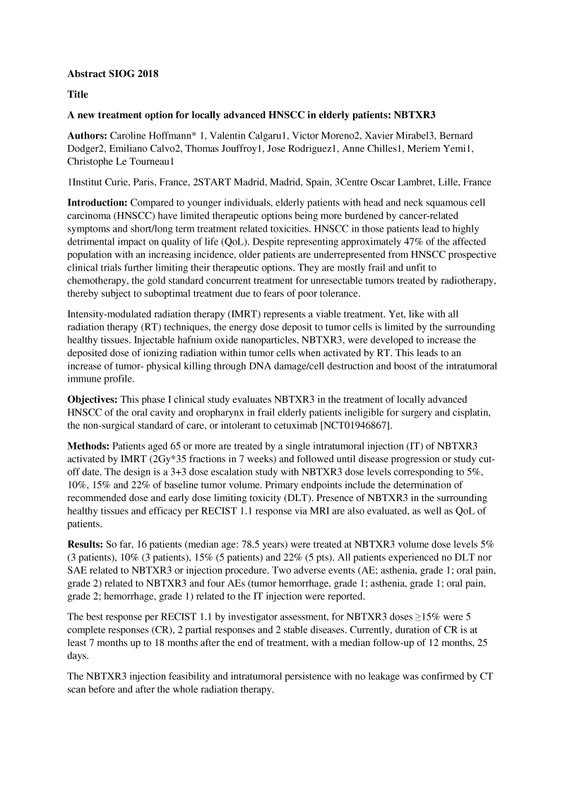 This phase I clinical study evaluates NBTXR3 in the treatment of locally advanced HNSCC of the oral cavity and oropharynx in frail elderly patients ineligible for surgery and cisplatin, the non-surgical standard of care, or intolerant to cetuximab. Overall, preliminary results show a very good safety profile with favorable signs of efficacy, indicating NBTXR3 as a promising future treatment for frail and elderly patients with locally advanced HNSCC burdened from limited therapeutic options.